Here’s the excellent simulation/re-enactment video from Simpact on the Elaine Bromiley Case that I featured in the lecture. Frerk et al’s article on the 2015 guidelines is available from the BJA here (open access), and the excellent recent editorial on front-of-neck access by Timmerman, Chrimes and Hagberg is here. This is not in the notes, as it has only just been published online. The links to the different algorithms are on the Algorithms page, or you can browse the DAS website. The surgical airway technique video that woudn’t play is below. OAA/DAS Guidelines for Difficult & Failed Intubation in Obstetrics! Hot of the press – the Obstetric Anaesthetists’ Association and Difficult Airway Society have released their combined guidelines on difficult and failed intubation in obstetrics, which are freely available from Anaesthesia online. 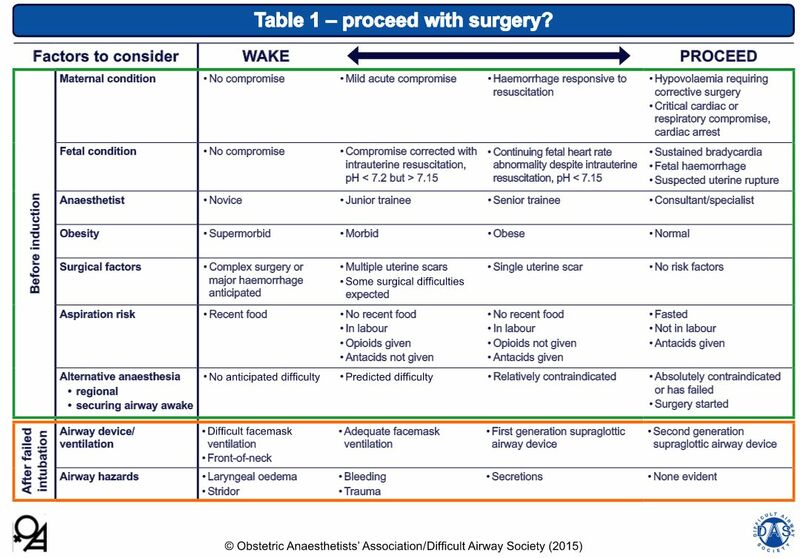 Decision guide for awakening or proceeding with surgery, from the guidelines. Stressing good positioning for airway management is absolutely critical in this population, and especially in practice environments where patients tend to have a high BMI (a common situation in our South African setting). The guidelines include ramping and the ear-to-sternal-notch (E2SN) position. The inclusion of cricoid pressure will inevitably spark the usual debate, but it is this author’s contention that this is likely an appropriate use until more evidence to the contrary emerges. The guidance to consider CP reduction or release in the event of difficulty is apt. The inclusion of gentle face-mask assisted ventilation during RSI is a welcome inclusion. Will we see NPO2 or HFNC included in later editions as more outcomes evidence emerges? Advocating the use of VL in obstetrics certainly sounds like a good idea, but is not attainable for most of the developing world. This is a huge area for growth/research – the development of low-cost VL solutions. This is a great step forward in promoting safe airway management and guiding training in a particularly dangerous corner of our practice.